Lauren Jorba is the Recreation Officer at Mount Victoria Lifecare and a regular visitor to our museum. After Lauren’s many personal visits she decided her residents would like it too. Lauren organized a trip to Petone Settlers Museum on a recent Thursday. The day was rainy with strong winds, violent at times but this didn’t change their plan to visit our windy, but beautiful, Petone Foreshore. Lauren brought a group of five residents, here they are in front of the Lifecare van. I just loved the whole experience of meeting Lauren and her Mount Victoria Lifecare residents, the group of such a lovely and happy people!!! You are a very special to me and I am looking forward meeting you again! 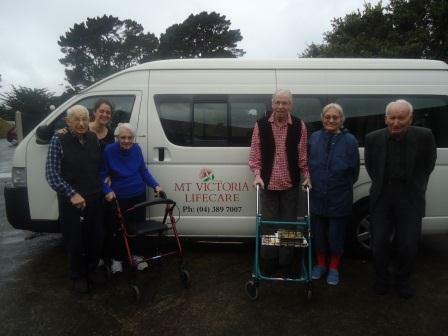 This entry was posted in PSM, Visitor of the Week and tagged Mount Victoria Lifecare, Visitor of the Week. Bookmark the permalink.